How does Wi-Fi work on a plane? As airlines invest to offer customers the best and fastest Wi-Fi services on board, here is a look at how Wi-Fi is provided and how widespread quality in-flight connectivity could impact the airline industry. BA’s high-speed bandwidth will work with Apple, Android and Windows, so passengers can connect on a variety of devices. Credit: British Airways. With on-board internet connectivity set to play a major role in what airlines offer in the skies, how can airlines maximise their own opportunities while simultaneously meeting customers’ expectations? Currently around four billion passengers fly each year with only 25% of aircraft offering some form of on-board internet connectivity. A study by the London School of Economics (LSE) showed that airlines’ broadband-linked ancillary revenues for 2018 were at $0.9bn (part of a market of $3.8bn). Maynard says there are several vendors which are disrupting the in-flight Wi-Fi market. 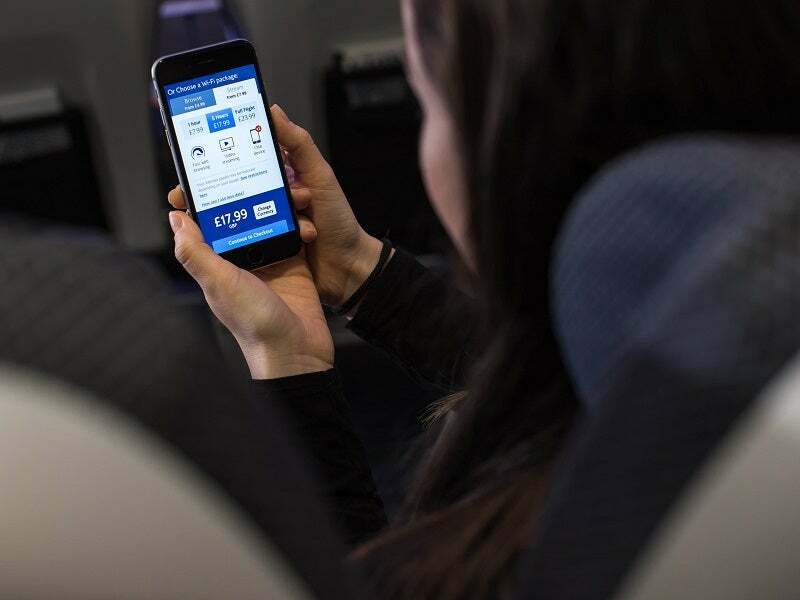 Air France has equipped some of its aircraft using Gogo’s 2Ku high-speed satellite connectivity system and the airline intends to offer Wi-Fi across its entire fleet by 2020. It offers three tiers of connectivity: messaging (free), surf, and stream (for audio and video streaming). The airline is also offering online shopping through its in-flight portal. Norwegian Air was the first airline to offer passengers free in-flight Wi-Fi on all European flights in 2011 (covering email, browsing and text messages). It provides in-flight connectivity through the CabinConnect™ platform by Collins Aerospace, which uses Inmarsat’s GX satellite network. It has recently launched an upgraded Wi-Fi experience on its Boeing 737-800 aircraft as part of improving the customer experience, which offer faster speeds. Maynard says that Norwegian offering Wi-Fi on short-haul flights is having a disruptive influence on the market because it alters customer expectations for what low-cost carriers can provide. While passengers can expect to see more Wi-Fi connectivity opportunities creeping onto short-haul flights, its rollout will be slower than on the larger aircraft because the economic margins are tighter. While the US has had access to Wi-Fi for years, it is just taking off in Europe. Weidemeyer says that Inmarsat’s award-winning European Aviation Network (EAN), which he describes as “the world’s fastest in-flight connectivity service built specifically for Europe”, will launch later this year. With 80% passengers travelling with at least one device, LSE’s study states that some airlines will remove in-flight screens to allow for own-device streamed content. “This can also reduce fuel costs through lower weight, with almost 700kg removed for a single aircraft,” it states. “We’ve seen significant growth in our aviation business over the past few years and, with the in-flight connectivity market predicted to be worth $130 billion by 2035, this growth shows no signs of letting up,” says Weidemeyer.